A story about two young runaways each seeking out an estranged parent. Their stories take place 50 years apart but share a deep connection. "Wonderstruck" really had everything going for it. It is written by Brian Selznick, who wrote the best picture-nominated "Hugo," one of our favorite films of 2011. It is directed by Todd Haynes, who directed the Oscar-nominated "Carol," one of our favorite films of 2015. It also has a score composed by Carter Burwell, who has arranged the music for some of our favorite Academy Award-nominated movies including "Fargo," "True Grit," and this year's "Three Billboards Outside Ebbing, Missouri." Everyone working behind the scenes of "Wonderstruck" has been involved in fantastic projects, so needless to say we expected great things. This movie is a family drama that tells the story of two twelve-year-old children. One of them is a boy named Ben, played by Oakes Fegley, who is living in Minnesota in 1977. After being struck by lightning, he loses his hearing and quickly runs away to New York in search of the estranged father he never met. The other is a girl named Rose, played by Millicent Simmonds, who is living in 1927 and has been deaf her whole life. She runs away from home to New York in search of her estranged mother who left the family in pursuit of an acting career. These two wander the street of the city searching for their place in parallel stories that share multiple connections. As we said, "Wonderstruck" has all of the components necessary to make a movie we would love. Unfortunately, we did not. Let's start with the good. The movie does have some interesting elements as half of it is shot as a silent film in black and white while the other half looks more like a modern picture. We love the inclusion of a deaf actress in this movie. So often in Hollywood, actors who are not actually disabled get to play disabled parts because it is easier to cast a known actor than it is to take a chance on someone new who is actually disabled. We appreciate when a movie is inclusive, and Millicent Simmonds does a tremendous job, as does her counterpart Oakes Fegley. There is a sequence towards the end of the movie that is played out with diorama-style figures. The sets, the score, the look of these final scenes are impressive. We loved watching the magic of the ending unfold right before our eyes. These final moments give the audience the meat of the story and show how everything is connected, though it is mostly done through expository dialogue. That being said, everything leading up to the end point is sadly poorly paced and drags on for far too long. The movie is just shy of two hours, but it easily felt 40 minutes longer. The film mostly consists of watching the two kids wander around New York City with very little excitement, tension, or intrigue (apart from a moment or two). The only reason we get any real connection between the stories at all is due to the aforementioned exposition scene at the end. The screenplay doesn't exactly go into why Ben's mom, played by Michelle Williams, never talked about his father. It doesn't explain why everyone was kept in the dark about Ben's dad other than the sadness that arises from talking about how he left their family. Look, we don't need our hands held, but a little bit more information would have been nice. There is so much left unexplained and unexplored that we feel like the movie as a whole was missing something big. 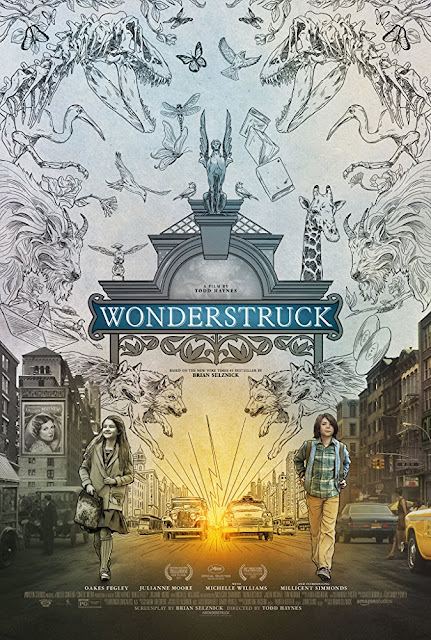 In the end, "Wonderstruck" benefits from two excellent performances by Millicent Simmonds and Oakes Fegley. The ending saved the film for us. It is one full of brilliant filmmaking techniques and neat visuals. Unfortunately, the story can be a dull drudgery without enough intrigue for a movie that was supposed to be magical. We wish we had liked this one more than we did.